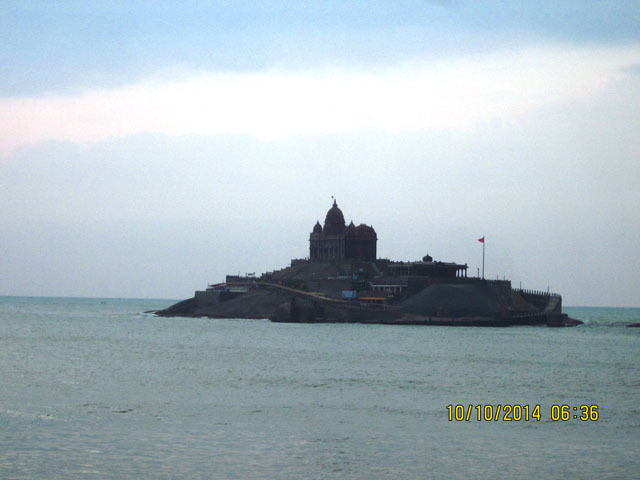 Touching the farthest end: Visit to Rameshwaram, Madurai and Kanyakumari - Ghumakkar - Inspiring travel experiences. A week-long trip to Chennai planned especially for my sister’s wedding shopping culminated into an equally spiritual journey into the city of temples Madurai, Rameshwaram and finally India’s southern tip at Kanyakumari. Post the fun-filled colorful Durga Puja/Dusshera celebration ended we headed straight for Chennai on the October 4th morning. We stayed at a central government employee guest house in Besant Nagar just a 10 minutes walk from the beautiful Elliot beach. 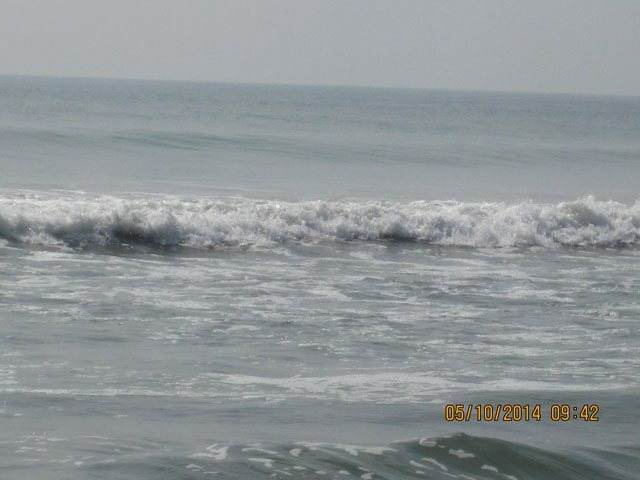 Every morning and evening we went for walks to the mesmerizing beach which turned into one of the most happening places by the evening with hosts food joints, cake shops and crowds of people of all age groups. 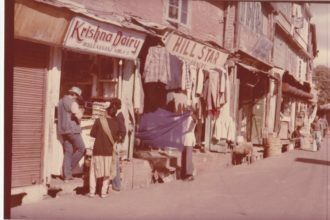 Thus started our journey, walking through the busy pre-Deepawali lanes of T-Nagar hunting for wedding sarees and jewellery. We finally got good bargains and exotic collection of the trousseau. Much satisfied with our purchases but already tired through the 4 days of hopping from shop to shop through the hustle-bustle of the city we headed for our next destination to Rameshwaram. On the evening of 7th, we boarded our train Rameshwaram Express from Chennai Egmore to reach Rameshwaram early next morning at 4 am. The train reached the destination on time and we headed to the city in a taxi. Our visit to Rameshwaram was meant for a havan to purify ourselves and pray for the wellbeing of the departed souls in our family tree. So basically it was meant to be an entirely spiritual stoppage. 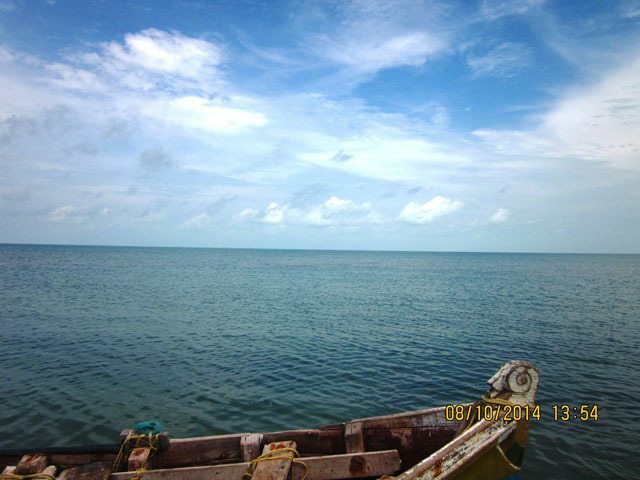 Rameswaram is an island in the Gulf of Mannar and is shaped like a conch as in Lord Vishu’s hand. It is believed that a pilgrimage that starts at Varanasi is complete only after the worship of Lord Ramanathaswamy at Rameswaram. We were three families in all, all the brothers of the Iyer family clan with their respective spouses. After the first session of the havan we had to take a holy dip in the Agneetheertham and proceed to the Sri Ramanathaswamy Temple. The seashore famously known as the Agneetheertham is about 100 metres from the main entrance of the temple. Pilgrims are required to take a bath here since the water is considered to be sacred and perform pujas in the honour of their ancestors. 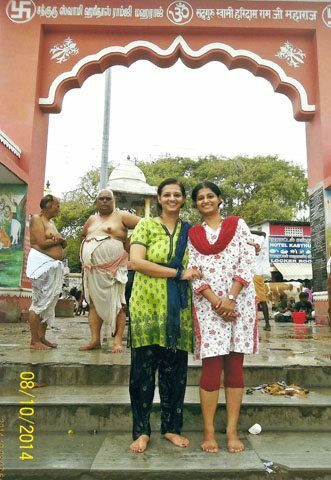 After taking the holy dip and getting some family photos clicked we headed for the Sri Ramanathaswamy temple. Folklore says this is the same temple where Shree Ram performed puja for Lord Shiva and Goddess Parvati after defeating Ravana. Since Ravana was a Brahmin and killing a Brahmin was considered a huge crime, Shri Ram prayed in penance. From here the pilgrims enter the temple and have to pass through 22 wells, every well has its own significance and before the darshan, it is mandatory to pour a bucket of water from each well. Here lays the toughest part, getting drenched in 22 buckets of water. While walking to the alley of the temple to move to the subsequent well one gets impressed by the elegant architecture of the temple. The temple is known for its awe-inspiring corridors with mammoth sculptured pillars along both the sides. Some figures on the internet suggest that the longest corridor ever in the world is here; it measures 197 meters long from East to West and 133 meters wide from South-North. 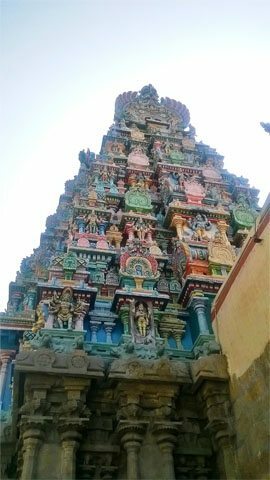 The temple has a Gopuram 38.4 meters tall. Rulers from various eras in the 12th century AD constructed the temple. 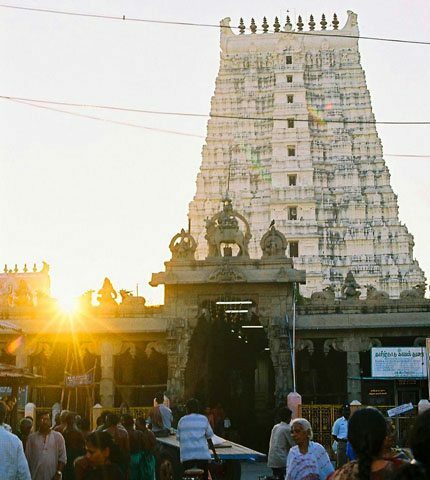 The temple houses the Spadikalingam that was given by the Shankaracharya to this temple. Another teertham from here leads to Dhanushkodi, the easternmost tip of Rameshwaram. Legend says Lord Rama struck the bridge that he had built to Lanka at this place with the tip of his bow and thus it broke. Interestingly our bus driver informed us that Sri Lanka was only 20 minutes by boat from here. History of Ramayana as we have seen on television unravelled right in front of us. It was quite intriguing indeed. We were through with the puja almost by the end of the day and boarded the bus for Madurai. It takes about three hours to reach Madurai by bus. 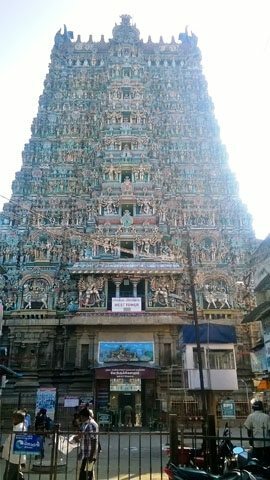 We checked into our hotel after a tiring day and woke up early to visit the Meenakshi-Sundareshwaran temple more fondly known as the Meenakshi temple. Madurai has been the centre for learning and poetry since time immemorial under the aegis of Pandyas and Nayakas. The temple is believed to be 2000 years old and was added to by the subsequent dynasties. The temple, as today, spans across 65000 sq meters. The temple houses twin temples of Lord Shiva or Sundareshwaran and Goddess Parvati or Meenakshi, Meenakshi due to her eyes “aakshi” shaped like fish or “meen”. The temple is adorned with ceremonious paintings and sculptures. The most eminent feature of the temple is the hall of thousand pillars or Ayiramkaal mandapam. All in all, there are 985 grand pillars with fascinating and pompous sculptures. The pillars carved out of stone are called musical pillars since when tapped they produce a varied musical note. It is best to visit the temple either early in the morning or late in the evening since thousands of tourists throng the temple all through the day. 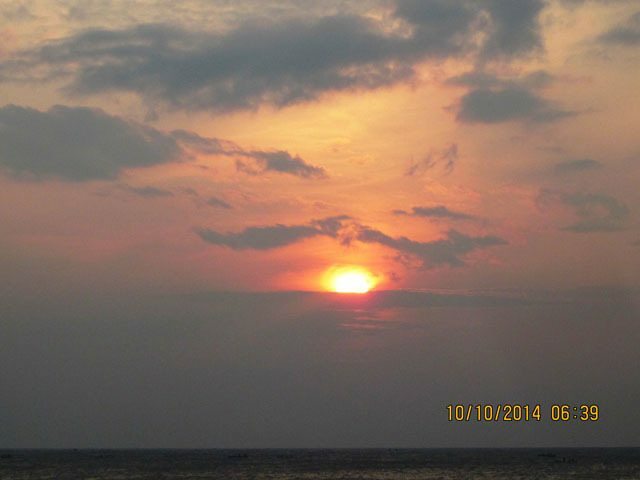 As the day came to an end, we boarded an overnight bus late in the evening to reach Kanyakumari. It was about a 5 hour journey. We reached Kanyakumari and checked into the hotel by 3:30am. Our first agenda here was to see the sunrise. The bus started from the hotel at 6am. The sun rises here by 6:30am. As we reached the bank of Vavathurai, India’s southernmost tip, the sky began to change colors. From a bluish serene sky emerged orange streaks partly hidden under the white cover of the clouds. A conch was sounded with hoisting of the red flag at the Vivekananda Memorial to commemorate the rise of the sun. Slowly but steadily the breath taking beauty of the first rays of the sun piercing through the clouds engulfed all the tourist. There was absolute silence for a minute and extreme enthusiasm the very next. 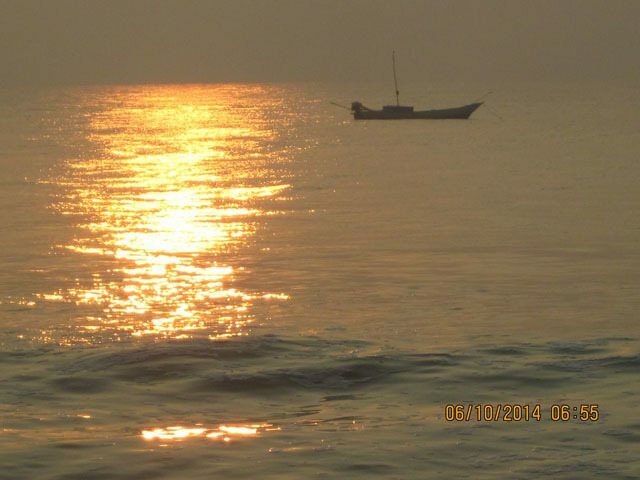 We watched spellbound the beauty of nature and suddenly the sunrays painted the sea with millions of shades of orange. Fascinating and tranquil, just two words to describe the entire picture. We thoroughly enjoyed the rays of sun dancing over the waves while at a distance a fisherman boat gently threw the fishing net into the water. Carrying the beauty in our hearts we headed for our next destination to Suchindrum Anjaneyar temple. The temple falls midway between Kanyakumari and Nagercoil, about 7 kms from Kanyakumari. Our bus driver showed us the 4 way intersection road of which one goes straight to Srinagar a distance of about 3800 kms. 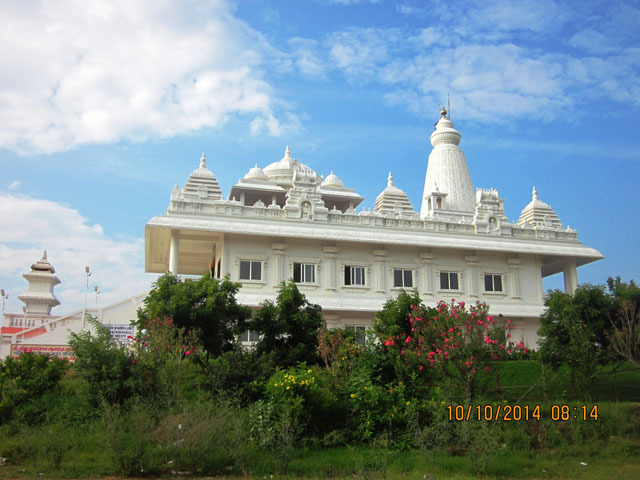 The temple is alternatively called as Thanumalaya Perumal temple. 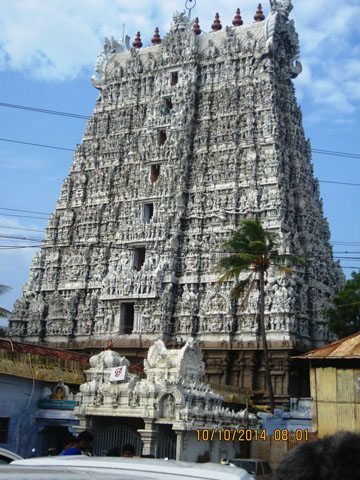 The temple is an astute piece of architecture with its 7 storeyed white Gopuram carved with intricate sculptures of various deities. It is specially famous for its 22 feet Hanuman statue carved out of a single block of granite The temple houses a linga that depicts Shiva, Vishnu and Bramha all in one; indeed an example of spectacular architecture. We were lucky enough to reach the temple during the “abhishekam” of Hanuman. A must see, the entire ambience was charged with soothing vibration of the drums and varied musical instruments played during the process. Another striking feature of the temple was the musical pillars. Every pillar when struck created a different musical note. Finally we left the temple awed by its divinity to head to the Sainath temple in Potraiyadi, 7kms from Kanyakumari. The temple is close to Suchindrum. The baba’s temple looked serene standing tall in white color. 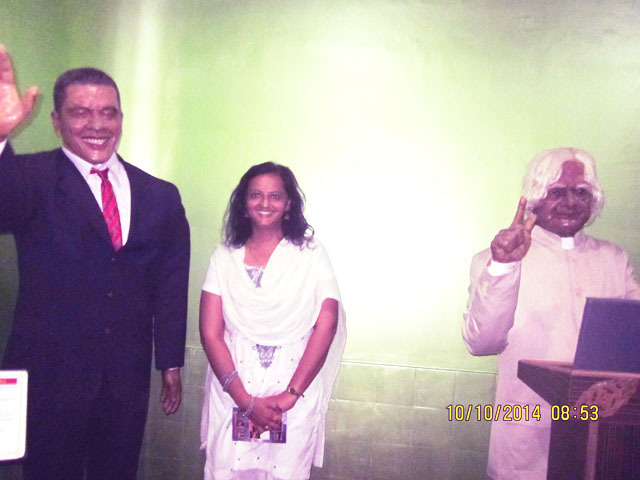 After offering our prayers here we headed to the wax museum, the lone wax museum of India, inaugurated in 2005 December. The museum is similar to the famed Madam Tussauds Wax museum of London. It was an enthralling experience to be in the company of some of the greatest leaders and emissaries of the world. We were tired now site visiting since 6 am so we decided to take a break and bite into some sumptuous aloo parathas (punjabi style!) ofcourse…at a Punjabi Dhaba in Kanyakumari…what a delight! All refreshed we started are journey to the Vivekananda Rock memorial. Poompuhar Shipping Corporation operates frequent ferry services from the shore to the rock memorial at regular intervals. It is here that Swami Vivekananda gained self realization. 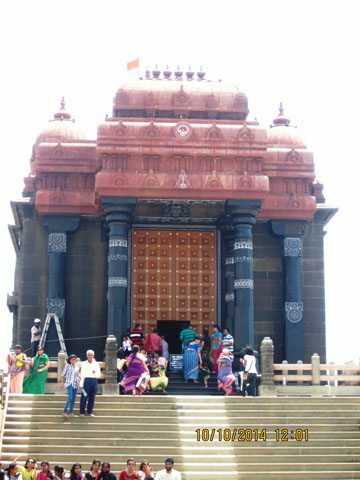 The memorial houses a statue of Swami Vivekananda and comprises of a meditation chamber. The structure was built in 1970 and is a commendable piece of architecture standing in between nowhere. The waves lash the rock at enormous speeds and it is rejuvenating to just stand on the elevated corridors and look into the vast expanse of the sea merging with the cerulean sky at a distance. In vicinity of the Vivekananda Rock is another rock called Sripada Parai, meaning the rock that has been blessed by the touch of the feet of the goddess. This is the Goddess kanyakumari’s temple. 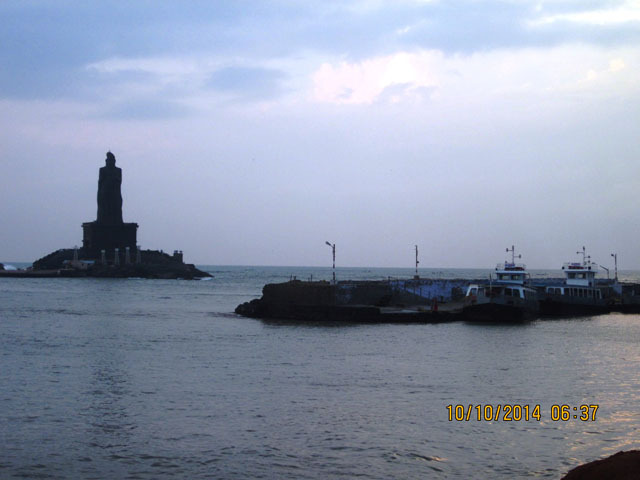 The ferry takes one from the Vivekananda rock memorial to the adjacent rock where stands the great Tamil poet Thiruvalluvar’s statue. 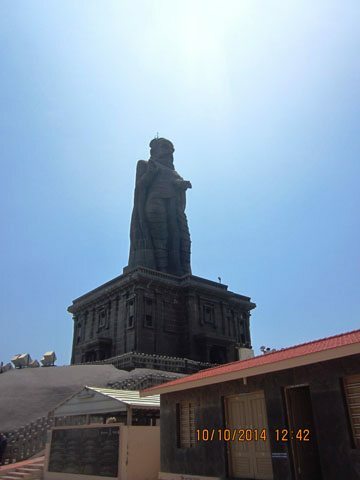 As per the information in books and the internet the pedestal of the statue is of 38 feet height and the statue over it is 95 feet tall with a grand total of 133 feet for the entire sculpture- a quintessential work of art! After witnessing the beauty and grandeur of Kanyakumari we set out for our rooms to pack our bags and start the onward journey back to Chennai to catch a flight back to Delhi. Thus ended our momentous holidays with apt amalgamation of spiritualism and art and architecture in the embrace of nature; amongst the meeting of Indian Ocean, Bay of Bengal and Arabian Sea; getting lost in the legend of epic Ramayana. An incredible destination and equally overwhelming journey! Thanks for taking us to the city of festivals. Reading your posts always gives a good amount of energy to the readers like me who loves to proceed on family trips. Congratulations for your sister’s wedding. Thanks alot for the wishes and the appreciation. I have been a regular reader of Gumakkar. Your travel log is informative and useful. Thanks for writing. Thats quite a long haul of temples in one single visit. Thank you Mala for sharing this with us. Those statues in the wax museum do not look as detailed/rich as in some of the other wax museums. Yes indeed it was a long and never ending trip!! Finally we got over with it really exhausted…but since it was planned by the entire family or kutumb as we fondly call it there was no escape. The wax museum was quite naive and small. Just an attraction for tourists there. Since i haven’t visited any other wax museum thus far, it was a nice experience for me. ???? ?? ????????? ???? ? ?, ????? ??? ????? ?????? ?? ????? ? ?, ????? ????? ?????????? ??? ?? ???? ?? ???? ????? ????? ??? ?? ?? ??? ??? ???? ?? ???? ?????? ?? ????? ????? ?? ??? …. ????? ????? ?? ????????? ?? ??? ?? ??? ??? ???? ????? ?????? ?? ??????????? ??? ???? ?? ? ?? ???? ??? ???? ??? ????? …. ????? ??? ????? ?? ??? ?? ??? ?? ?? ????? ?????????? ??? , ?????? , ????????? , ?????? , ?? ??????????? ??? ????? ?????? …. One week is enough for the trip from Chennai to Madurai, Rameshwaram, Kanyakumari and back. You can read my blog, all the information is there. Aap Chennai se in teen destination ko kaise bhi manage kar saktein hain depending on the availability of trains or bus. Do let me know if you require any specific information. Thanks a lot….can u pls also tell some good stay options (Affordable ) @ Kanyakumari.. I have planned only for 1 day @ Madurai and then in the night i hv to go for Kanyakumari, so is one day is enough for Madurai to visit or need to stay one day and night?? i am planning a tour Rameshwaram, Srisalalm & Meenakshi temple with my elderly parents . kindly help me out how to plan and how many days require to visit. or shall i add or delete any place from the list. and is there any direct train available. While recently listening to the above gazal of Ahmad Faraz,by Mehdi Hassan,the line ”jis tarah sukhe hue phuul kitabon mein milen” jogged my memory about the old faded travel photographs of years gone by lying, for decades, in the trunk in the basement.